You’ve heard it before: Things have to get worse before they can get better. It’s a doctrine many of us learn first from our parents, as children, when they’re trying to teach us the unintuitive notion of delayed gratification. Tighten your belt, build character, learn your lesson the hard way. You’ll be rewarded in the end. Then you grow up, and you read the newspaper. You live through its contents. You're told to learn the same lesson again, but this time they call it economics, or creative disruption, or homeland security. This is the way of things; this is reality. “Things have to get worse before they can get better,” the politicians say. To scratch this kind of talk is to reveal an old heresy beneath the veneer of common sense. And the need has never been more urgent to refute it. When I and several hundred thousand people demanding action on climate change marched through Midtown Manhattan on September 21, 2014, apocalypse was on our lips. We were marching to save the world—to change everything, as the propaganda beckoning us to participate had said. Wave after wave of marchers paraded through the city, carrying hand-painted banners and giant puppets, hopeful and joyful despite the likelihood of more political inaction to follow. After a few hours in the streets, we could hear each other's tired voices wondering what it might take for real change to happen. Things would have to get worse in certain places—drier droughts in California, maybe, or more catastrophic hurricanes in New York City. A few thousand of us, dressed in blue, made that point visible the next day by clogging up traffic near Wall Street, likening ourselves to a flood of rising seawater. The COP 21 summit in Paris last year seemed to corroborate the overall story. That dismal number, 21, marked the number of years that the world's leaders had failed to take seriously the rising temperatures, the worsening storms, and the droughts feeding geopolitical mayhem in places like South Sudan and Syria. After 21 years, at least, things had started to become bad enough. Even the Pentagon and Michael Bloomberg were voicing worry about how the climate crisis would affect their business-as-usual. The negotiations in Paris produced a deal, though one inadequate to prevent many of the catastrophes that computer models predict. Once again, it seems that things will have to get worse before they can get better. Things? What things, and whose? Worse for whom, and better for whom? In times like these it's hard not to see that there is apocalypse in the air, but the question that really matters is what kind. That’s the trouble; that's the scam. There are many kinds of apocalypse stories. One can wait for the climate apocalypse to come, or one can see that it is happening already, especially in the pockets and places far from centers of power, where people live closest to the earth. These people are already on the brink. Things can get worse before they get better, but who says that they must? This doctrine has a history. It has appeared in many places and times. But for American culture, it is through dispensationalism—a wildly popular, yet little-discussed, kind of Christian theology—that the idea of things getting worse before they can get better has been hidden in plain sight. Dispensationalist theology first took hold in the United States thanks to a man who hit rock bottom. Cyrus Ingerson Scofield fought for the Confederacy in the Civil War then started practicing law despite a lack of formal schooling. He made enough of a name for himself that President Grant appointed him the U.S. attorney to Kansas. But he drank more than was good for him, got divorced and probably wound up in jail. By and by, he found Christ in 1879 and, in 1883—again, with no formal training—became pastor of a church in Dallas. His charisma swelled it from tiny to enormous. He expanded his ministry to a prominent church in Massachusetts and then to an empire of Bible correspondence courses and colleges and conferences through which his ideas spread. His chief legacy, however, would be a collection of annotations for the Bible, a firm-handed guide through the bewilderments of scripture. Along the way, Scofield encountered the writings of a marginal Irish preacher (and fellow lawyer), John Nelson Darby. Scofield, following Darby, taught that God governs and manages the world according to a sequence of distinct ages, or dispensations, each with distinct sets of rules and expectations. Each meets some kind of catastrophic end. In the Bible, as in Scofield's life, things always got worse before they could get better—for instance, by Noah's flood, or the destruction of Jerusalem's Temple, or whatever social degeneracy we observe around us. Fear not, for God is in control. The job of believers is to accept whatever dispensation they're in and await, like eager spectators, the next catastrophe. Understanding sacred history like this has consequences for the present. Justice and peace need not be strived for now; we're not in the right dispensation yet. Dispensationalists have held that even the beloved commands of Jesus in the Sermon on the Mount can be neglected—love your enemies, give what you have to those in need, do for others what you’d have them do for you. As one of Scofield’s later followers reasoned, “Every businessman would go bankrupt giving to those who ask of him.” Dispensationalism permits a dose of pecuniary sense to some of the Bible's more demanding social teachings. This theology spread in tandem with modern corporate capitalism, aided by Gilded Age benefactors like California oilman Lyman Stewart. A later follower of Scofield's imagined that Christians who persevere through the present tumult will get to serve as a “ruling aristocracy, the official administrative staff” of Christ’s corporate kingdom to come. The bureaucrat, thus, is the model believer: Play by the rules you’re given, as excellently as you can, and even as the planet is engulfed in flames rest assured that all is well. Few authors have been so influential in U.S. intellectual history as Scofield while winning so little credit from the intellectual establishment. Especially after the apocalypse of World War I, the Scofield Reference Bible became the best-selling annotated Bible in history and probably the most successful book Oxford University Press has ever published. 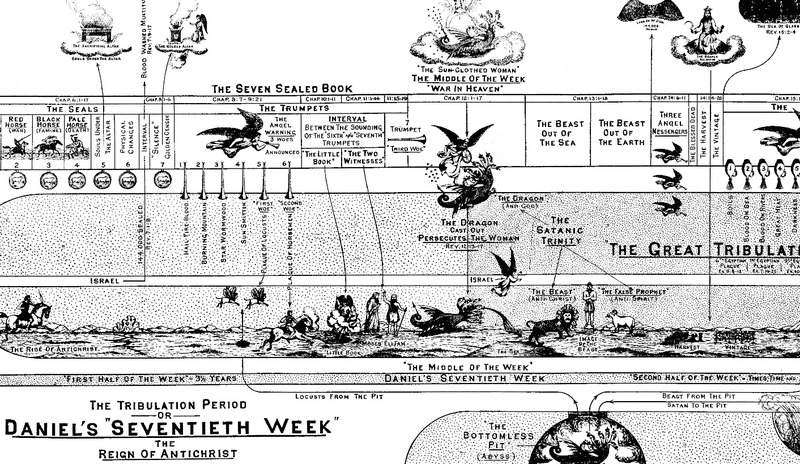 Since Scofield, dispensationalism has lived on in U.S. evangelical culture's fascination with predictions of Rapture, Armageddon and the Antichrist. But it is far from just a religious heresy. Dispensationalism is at work whenever we conclude, in conviction and resignation, that things have to get worse before they’ll get better. It amounts to acceptance of eventual self-destruction as a tolerable path to be on, and blindness to the most vulnerable among us who are already being destroyed. It turns up on every part of the political spectrum, from followers of Karl Marx to those of Ayn Rand. We tell ourselves a dispensationalist story each time another economic crisis comes around, when “the economy” gets saved and an official sigh of relief is breathed while millions of people suffer foreclosures and layoffs that tear apart families and impoverish communities. For now, at least, in this day and age, this is what must be done. These are the rules. “Apocalypse does not loom before us equally,” Catherine Keller writes in her study of the Book of Revelation, Apocalypse Now and Then. Keller, who teaches theology at Drew University, points to a way of imagining apocalypse that is very different from the dispensational kind, one that better suits our ecological challenges. But her analysis begins with the Bible. In Revelation, figures like the seven-headed Beast and the Antichrist have been interpreted through the centuries as representing strongmen, or nations controlled by men, who engage in wars that men will fight. “The revealing gaze is male,” Keller writes. The upshot: These are the characters in the world that matter. The stories of women and others on the receiving end of power don’t play more than supporting roles in this grand story; these are the kinds of people who have to endure while things get worse before they get better. In the meantime, proto-apocalyptic corporate empires are free to go on, in Keller's phrase, “manfully sucking the planet dry.” Every century reinterprets the figures to fit its reigning principalities. But what else might the text mean if we're not asking it for a story of imperial politics? Some feminist scholars have sought to forgo apocalypse entirely, but Keller does not. What she proposes instead is that we allow ourselves to notice instances of “counter-apocalypse”—the struggles and revelations constantly taking place among those whom the masters of the present age deem insignificant. For Keller, the Book of Revelation is actually a model for how to “sustain resistance to destruction without expecting to triumph.” The hallucinogenic creatures and symbols that appear in its text aren't members of a governing bureaucracy, as the Scofields of the world would have it. Rather, they’re a palette of visions for people craving hope in the midst of what appears to be crisis and powerlessness. John the Revelator first penned this prophecy during a time of apocalypse imposed from Rome. The strange, diverse images he conjured show how even that apocalypse had many sides—the trumpeter angels, the Lamb, the woman in the pangs of birth. He preached to the churches of seven cities, each with their own story to live through and to tell. Scofield's system proffers an overall unity in the mayhem, a reassuring coherence; Keller cleaves to the multiplicity. Among the Johns of today are native communities whose treaty rights are being revoked so crude oil can be extracted from under their feet; farmers who live in perpetual debt to corporations that produce the seeds they’re forced to use; those in places prone to worsening storms who are unable to leave or rebuild. These should be crises for all of us. The way to respond to their counter-apocalyptic stories is not to keep on pushing papers for the status quo, waiting for a bigger crisis to come. This is when the Sermon on the Mount is most needed, when the meek on the front lines should be the light of the world. The rest of us can let ourselves see their light. We don't need to wait for the big climate apocalypse; the counter-apocalypses are here. Apocalypses are already happening, but the rulers of the present dispensation would prefer that we not notice; there is resistance happening, too, and they would prefer that we not join. They would prefer that we obsess about the cataclysm of their choosing, the one always just over the horizon. Waiting for more crisis is a luxury most people on this planet can't afford, and it's a heresy none of us should allow to fester. Those who long for crisis, and who imagine that it is necessary, betray their privilege. They are willing to believe crisis is needed because, on some level, they know they're well-positioned to ride the tremors and come out ahead. Environmental advocacy has tended to be a boutique faith for those who can afford it, those with enough comfort and leisure to contemplate a hegemonic mega-narrative to the exclusion of everything else. People of color in the United States are more likely to accept the reality of climate change, but caricatures of a largely white, affluent climate movement still hold too much truth. There are those who await a mythical “paradigm shift,” a “consciousness-raising,” for only then will the public be awake enough to take action. Meanwhile, too many of us are content to carry out small-scale acts of ecological piety—choose your own fashionable eco-local-green examples—while awaiting our eventual vindication when Manhattan and Dhaka are flooded for good. In his ecological encyclical “Laudato Si',” Pope Francis warned, “The same mindset which stands in the way of making radical decisions to reverse the trend of global warming also stands in the way of achieving the goal of eliminating poverty.” He outlined an “integral ecology,” a call to environmental action inextricable from justice among human beings. Stewarding the planet, Francis argues, should begin from the experience of the poor and the peripheries, not the anxieties of the powerful. When the native-led Idle No More movement spread across Canada in late 2012 to protest fossil-fuel extraction on tribal lands, few south of the border even noticed. No one stirs in North America as Chinese cities and towns rise up against the pollution of factories that feed our craving for cheap goods, or as Pacific islands sink. People living among the refineries of Houston’s East End, at the terminus of what remains of the Keystone XL pipeline, have been largely on their own in demanding the right to breathe clean air. These struggles are taking place at focal points of the power structure; this is where the present dispensation is susceptible to acts of love and to the support of outsiders who can lend it. In places like these, the possibility of a better kind of world can be unveiled. Front-line communities, at least, were at the head of the big 2014 climate march, and they were the ones who called for the next day's sit-in at Wall Street. The climate movement is learning. The crisis it faces is not singular, but plural—not a single story everyone should be paying attention to, but a collection of stories that we all can be gathering, hearing, honoring and living out. Until then, the movement will remain small and boutique because it won't realize how large it really is. Frustrated people will continue whispering that things have to get worse before they can get better. Wherever we are, those facing apocalypse at the margins can be our guides, and our hope. We can learn about their stories and share them. We can support their efforts. And we can learn from them about how to better steward our world before things get even worse. This is basic Sermon-on-the-Mount stuff. And it bears a simple and utterly non-dispensational revelation: Things will get better if we make things better for each other now, if we survive and love our neighbors where those who rule the present age want us out of the way. This is our calling, and it means no longer waiting for things to get worse. This is an apocalypse worth having. "Repent for the kingdom of heaven(on earth) is at hand". Jubilee release of captives is immediate. How do we implement it?! Prostitute politicians won't vote for it. If we stop paying they'll steal our land inheritance. "Officer of Peace" music video by the Wandering Monks. The "Jubilee Sheriff" must be paid with our own self-issued money. We will Cleanse God's Temple of the usurers' theft. Thanks for your comment. I think your point about self-issued money is a good one. Some of the efforts underway right now to experiment with alternative currencies are predicated on trying to abandon a money system that is built on debt and interest. This is a major concern, for instance, of Enric Duran, a Catalan innovator who had helped develop several alternative currency networks, and whose work I profiled here. I think this belief is grounded in a basic human desire to see punishment precede any reward. No good deed shall go unpunished. The evil people prosper. Everyone must suffer. You do not deserve happiness or blessings. Your life condition is the result of your sin (or your parents' sin). Humans propose, God disposes. Negative thoughts make people work harder. Do not spare the rod or you will spoil the child. ETC. Sadly, we have heard all this crap since we were born and then, pass it on. Could be. I'm not sure if it's necessarily a universal desire. But the point is: How much is enough? Do we have to wait for the rich to be punished before lightening the punishment already being felt by the poor? The author writes on too high a plane for the average reader to understand, therefore, not fully understanding most will not even begin to read the article. Speak to the common man/woman and suggest some common sense solutions to the problems that are raised otherwise the phrase that of "things have to get worse..." will remain the mantra. Schneider's commentary finds much backing in the meticulous work of Naomi Klein's, "This Changes Everything: Capitalism vs the Climate (Simon & Schuster, 2014). The pockets of resistance to fossil fuel expansion he refers to are, according to Klein, spreading. People on the margins are organizing and taking responsibility for their futures, much in synch with Francis's "Laudato Si." And they're being informed and motivated much by their faiths.. Yes. It was first written before Klein's book and film came out, but she and I were running in many of the same circles in the climate justice movement, and we spoke a bit around the time that Laudato Si' came out. She was very gratified by it, despite certain disagreements, as it reflected the very message she'd been trying to send to the broader climate movement—that the struggle should begin from the peripheries and the front lines, not from the well-protected elite. You might be interested in seeing the episode of Democracy Now in which Klein and I were interviewed together. Thank you. I've been working on a comparison of the two works, LS and Klein's, and the interviews resonate. My focus is on exploring commonalities between resistance activism and the moral underpinnings found in both. I worry that LS may die on the vine before Catholics come to full and effective terms with its call to act. Klein's analysis recounts the historical forces at stake in the distortions put forth not just by extractive industries themselves, but also by political leaders and aspirants, many of whom are Catholic. Indeed—I think the challenge Laudato Si' poses to the church is deeper than we have yet realized. Nathan Schneider is a reporter and professor of media studies at the University of Colorado Boulder, as well as a regular columnist for America. He has authored two books, Thank You, Anarchy: Notes from the Occupy Apocalypse, and God in Proof: The Story of a Search from the Ancients to the Internet.